The Vancouver Condo Buzz » West Burnaby THURSTON STREET Townhomes & Condos for Sale by Anthem Properties! West Burnaby THURSTON STREET Townhomes & Condos for Sale by Anthem Properties! 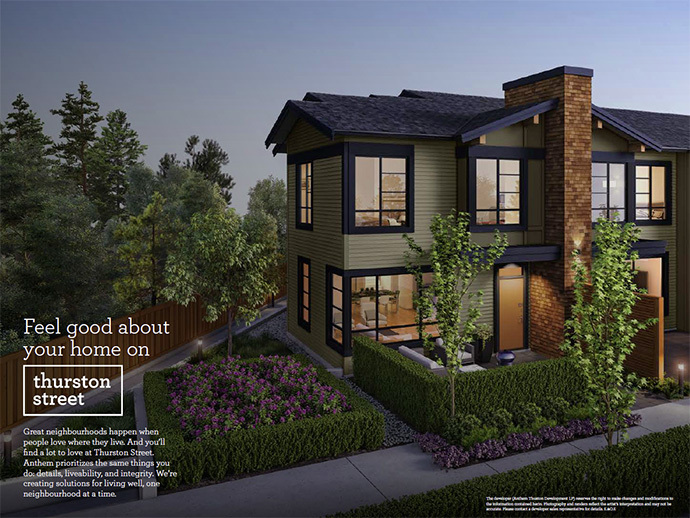 Located in a premium community you’re proud to call home, the West Burnaby Thurston Street townhouse project by Anthem Properties introduces well-crafted family style homes in a central location. Featuring 57 urban family homes ranging in size between 516 square foot studio garden flats to two bedroom and two level walk up homes over 1,300 square feet, there is a floor plan for every lifestyle and homebuyer seeking a well designed and affordable West Burnaby townhouse. The new Burnaby Thurston Street Townhomes by Anthem Properties is part of the developers’ Neighbourhood Series of homes, an authentic, connected community that works for how we live today. The development is very close to transit routes, urban parks, great schools, excellent shopping and community corridors. Because of these significant selling features, the new Thurston Street Burnaby townhomes are sure to garner a lot of great attention during the pre-sales phase coming in February 2015. According to their marketing brochure: ‘Feel good about your home on Thurston Street Burnaby! Great neighbourhoods such as West Burnaby happen when people love where they live. And you’ll certainly find lots to love at Thurston Street townhomes. Anthem Properties prioritizes the same things you do: details, liveability and integrity. They are creating solutions for living well, one neighbourhood at a time.’ And that’s why we love Anthem and what they stand for! Thurston Street Burnaby townhome’s website is located online at www.thurstonstreet.com. Visit today for more details as they are released in preparation for the grand opening sales event. Here are some of the incredible details and finishes that a homebuyer can expect at the boutique Thurston Street townhouse project in West Burnaby real estate district. Firstly, the exceptional kitchens will feature a KitchenAid stainless steel fridge, range and dishwasher in addition to a slide out AEG hjood fan and quartz counters. Other kitchen features include a double bowl undermount sink with Grohe Concerto pull out spray, porcelain tiled backsplash, full height or walk in pantries for storing big purhases, kitchen island with space for your microwave in select floor plans as well as a KitchenAid microwave (optional). The comfortable interior finishes and design include temperature control in every room, designer colour schemes, thoughtfully placed task lights, oversized energy efficient double pan low-e windows, horizontal blinds, walk in closets, carpeted bedrooms and laminate floors that are easy to maintain. Some of the beautiful bathroom features include semi-frameless glass shower surrounds, quartz counters, Grohe polished chrome fixtures, porcelain tiled tub surrounds, Duravit toilets, main floor powder rooms in most homes and very large and functional laundry room (most floor plans) with Whirlpool front loading washer and dryer. The West Burnaby Thurston Street townhomes are located in one of the most incredible neighbourhoods that is going through rapid change. The townhouses themselves are situated in a quiet cul-de-sac with virtually no traffic and there are community garden plots for growing heirloom tomatoes. The garden shed allows storage of tools and potting soil. The Thurston Street Burnaby townhomes will also feature gian garden chessboard with bench seating for spectators, concrete seating for enjoying an evening drink or weekend sun as well as bike parking, real cedar shingle siding and soffit lighting. For your peace of mind, the Thurston Street Burnaby townhouses will also feature large and secure storage lockers, secure parking underground, alarm system pre-wiring and the 2/5/10 home warranty by National. Bike to the market and barely break a sweat! These are the centrally located West Burnaby Thurston Street townhome project by Anthem Properties, one of the leading developers in the Greater Vancouver region. The new project will be coming fall 2014 with the release of beautiful 1 and 2 bedroom townhomes in the West Burnaby real estate district. The Thurston Street townhouses will affordable and beautifully finished. Live on Thurston Street, a quiet cul-de-sac minutes away from beautiful parks, shopping and regional transit routes. From the Anthem Properties email desk: Following the success of Station Square Metrotown condo towers, the fastest selling real estate development in Western Canada, Anthem Properties is bringing Thurston Street Burnaby townhomes, a limited collection of 57 townhomes, to West Burnaby real estate market. Buyers can expect the same quality, great design, and smart location that made Station Square a historic success. With prices starting from $269,900*, and plans from Jr One Bedroom Homes to Two Bedroom Two-level Homes, there is a home for everyone at West Burnaby’s Thurston Street townhouse project.